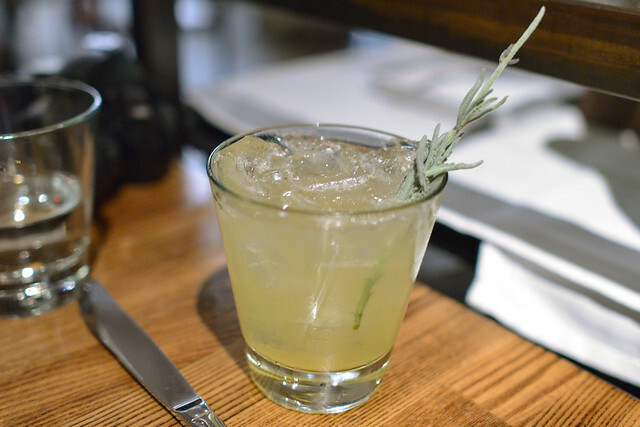 This cocktail had both sweet and savory elements, well-balanced with a lavender garnish accenting the finish. The meal began with easily the restaurant’s most notable dish. 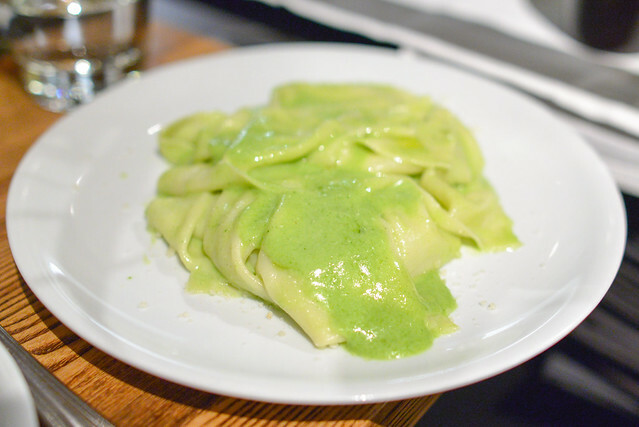 Silky layers of pasta were smothered in this delicate and subtle almond basil pesto. 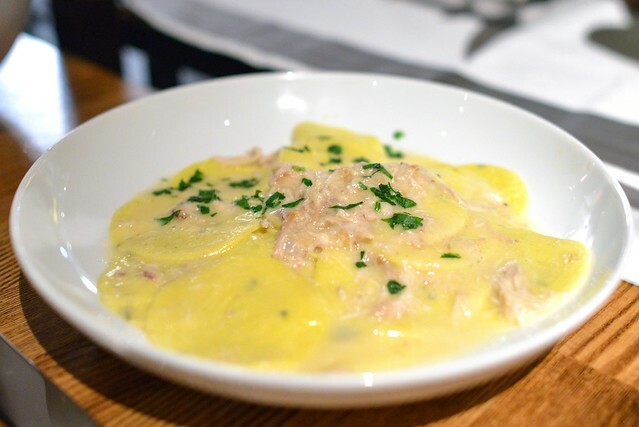 The texture of the pasta, so soft yet toothsome, was certainly a difference-maker. 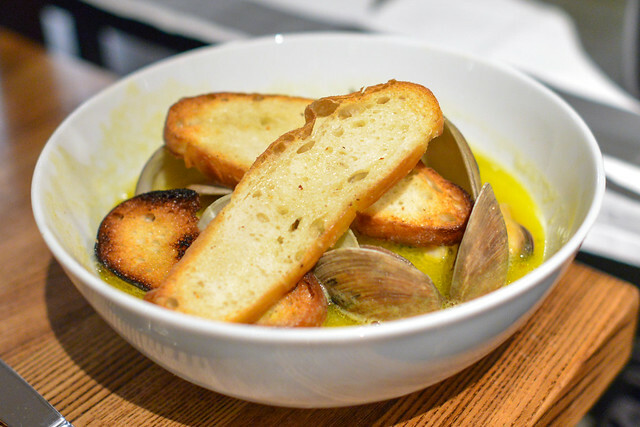 Plump clams and mussels were cooked perfectly in the savory broth. The grilled bread, served atop, made for great presentation but I would’ve preferred them served separately so that they’d keep their crust. I liked the hearty chew present in this pasta complemented by a rich sauce and sweet chunks of rabbit. More pronounced both texturally and flavor-wise than the handkerchief pasta. 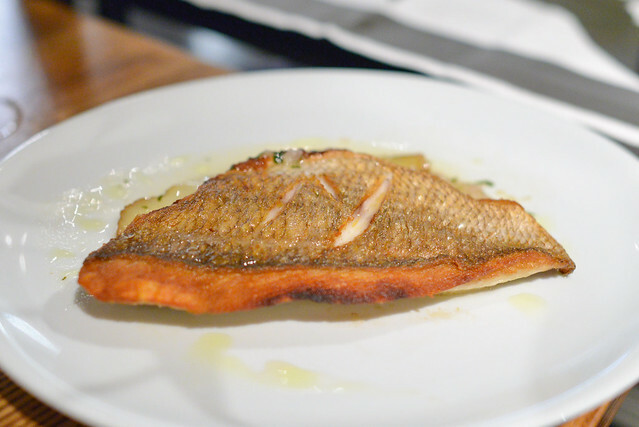 The fish was cooked beautifully with a moist flesh and crispy skin. The accompanying potatoes didn’t add too much though and felt oily; a lingering fish bone didn’t help either. 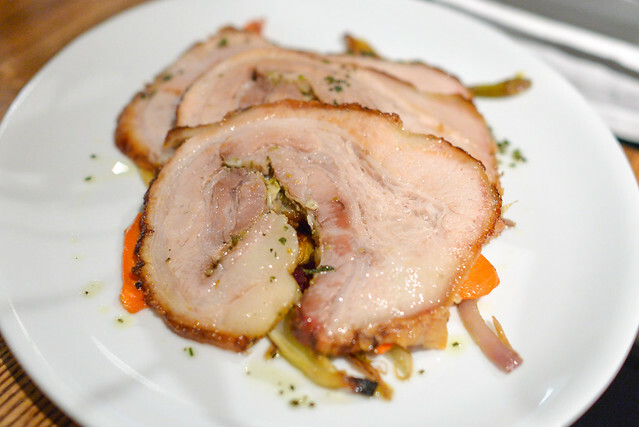 The porchetta, sliced pretty thinly, was packed with flavor. Glazed root vegetables were tasty too and provided some strong accompanying flavors. However I do wish the skin was crispier as most of it was fairly limp. Feeling more than content, we passed on dessert (which we had heard mixed reviews on). 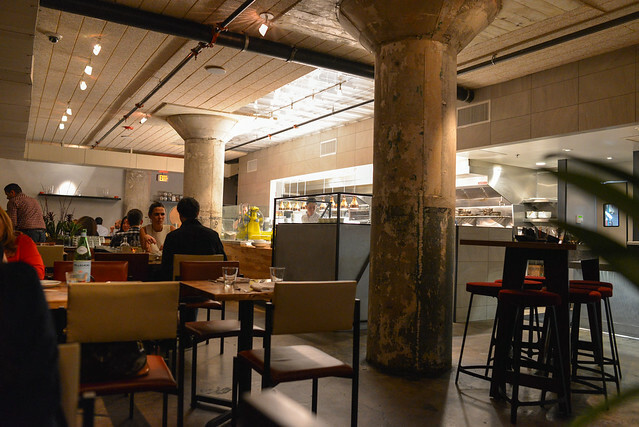 The Factory Kitchen presented a solid suite of dishes. 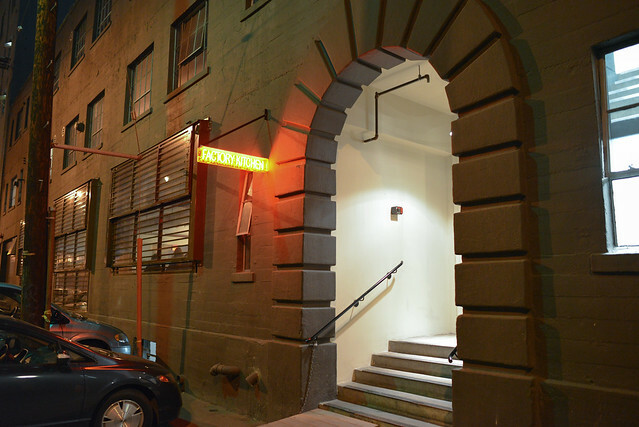 The food was relatively simple and execution mostly strong; in many ways, it does seem like a more casual Valentino or Drago Centro type restaurant. However, food-wise it lacks much of the dynamic flavors of a Bestia or the value of a Maccheroni Republic. For that reason, I don’t think it’ll end up in my regular rotation of Italian spots downtown. Still, that isn’t to say The Factory Kitchen would disappoint moderate expectations. 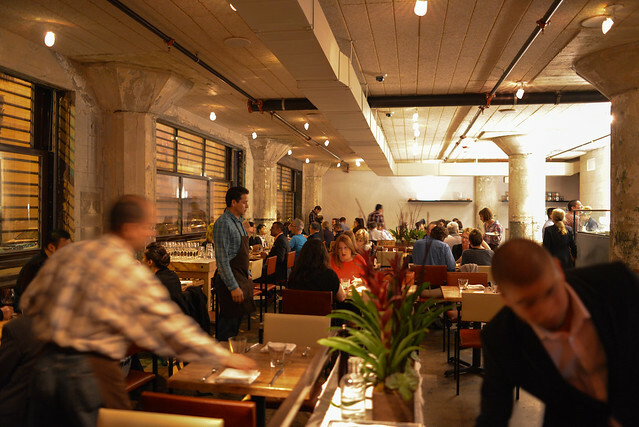 The restaurant offers, at least at this point, a relatively easy reservation, isn’t outrageously loud, and has more focused service than those competitors. I felt the same way about the place but you missed out on not ordering the fried sage dough with 24mo aged prosciutto, easily the best appetizer there and the cannolis are pretty outstanding, although not enough reason for me to return to the restaurant alone. Those two are on the board for next time…if there is one!